GOMA, Democratic Republic of Congo — The city awoke to artillery and mortar fire today as rebels with the March 23 Movement, or M23, pushed into the outskirts of town, taking control of North Kivu province’s main airport, a strategic point, around 11:30 this morning. Main streets in town were deserted, and local radio stations stopped broadcasting and only played music. Residents who had not fled as the rebels approached mostly sought refuge inside their homes. Along some side streets, women offered drinking water to the rows of government troops who trudged through on patrol, and young men helped soldiers carry their heavy weapons. Elsewhere, however, reports emerged of soldiers taking advantage of the chaos, looting shops and robbing people along the road. In advance of today’s attack, a large reinforcement of government soldiers, the FARDC, had come to Goma from Bukavu, the capital of South Kivu province. These reinforcements engaged with the M23 elements that had infiltrated the city ahead of the full rebel advance. Nevertheless, the bolstered FARDC ranks buckled under the onslaught from the M23 fighters, who were reportedly supported by an estimated 3,000 Rwandan soldiers who crossed into the border village of Kibumba from the Bigogwe military camp in Gisenyi, Rwanda. Attack helicopters commanded by U.N. peacekeepers engaged rebel targets on Saturday but failed to deter the rebel’s advance. An FARDC captain on the frontlines admitted in a phone call with Enough on Thursday that, despite some successful operations against the M23 on that day, morale was low and that their likely defeat would be in part due to "lack of food, ammunition, and troop rotation.” Frustrated by what they saw as a lack of support for the army under siege, military families in Goma took to the streets burning tires and throwing stones at MONUSCO patrols. 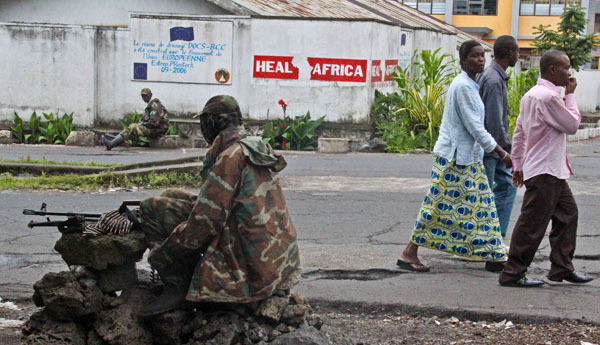 An unknown number of U.N. peacekeepers have reportedly been wounded. Civilians—many of whom were already displaced by insecurity and living in camps—have been on the move en masse since Saturday, when clashes between the M23 and the FARDC approached Kanyaruchina IDP camp, six miles from Goma. At least 60,000 people from the camp and surrounding area fled toward Goma. Even before the latest hostilities, fighting had forced more than 260,000 people to abandon their homes and seek refuge within the province, while over 70,000 have fled to Rwanda and Uganda, according to U.N. estimates. The evacuation and restricted movement of aid groups has compounded the vulnerability of displaced civilians and other communities reliant on humanitarian assistance for survival. "If fighting intensifies further, there are very few places people can go for safety," said Oxfam's humanitarian coordinator, Tariq Riebl. "With almost 2.5 million people now displaced across eastern Congo, this catastrophe requires a concerted humanitarian and diplomatic response." By mid-afternoon the rebels claimed full control of Goma, underscoring the lack of resistance they faced from FARDC or MONUSCO by marching down the main road to the “Grande Barriere” border crossing with Rwanda. The sounds of explosions stopped, and any remaining FARDC soldiers cleared off the streets, either fleeing the city or going into hiding. M23 made an announcement on the public radio calling on people to return to their homes, resume their normal activities, and even attend a military parade on Wednesday. "We will continue (resisting) until Rwanda has been pushed out of our country … There will be absolutely no negotiations with M23," said Congolese Information Minister Lambert Mende. The International Conference on the Great Lakes Region, the regional body that had been hosting talks on how to address M23, called an emergency meeting in Kampala on Sunday. The Congolese government sent a large delegation from Kinshasa to attend, including President Joseph Kabila. Despite the difficulties, there can be a way out of this situation, if policymakers take a stronger stand. One key venue for action is the United Nations Security Council, which is debating a resolution on Congo this week. "The U.S. government through the U.S. Mission to the United Nations needs to ensure that a strong international response is brought to bear on this massive humanitarian crisis in eastern Congo,” said Aaron Hall, the Enough Project’s Associate Director of Research. “Sanctioning the leadership of M23 alone is not enough. The U.S. should support the United Nations to quickly appoint an envoy to work with the African Union that would create a peace process to include all those actors that perpetually fan the flames of conflict in the region. Until the systemic drivers of violence and regional intervention in eastern Congo are addressed this scenario will just repeat itself on a constant loop." Speaking to Enough, M23 spokesman Lt. Col. Vianney Kazarama said that the group had no other choice than to advance to Goma to compel the Congolese government into direct talks. Whether today’s operations will be the immediate game changer M23 seeks will become clear in the coming days. Otherwise, there is every indication that the conflict zone will widen; asked about where the group has its sights set now, a senior M23 source told Enough they are “not going to wait even a week” to start making their way to Bukavu. TAKE ACTION: The U.S. government can help end the crisis. Now, more than ever, it’s time to show leadership. We need to encourage the White House to speak out against this rebellion. Send this letter Denis R. McDonough, the White House’s deputy national security advisor, and ask him to speak out against the M23 and for the people of eastern Congo.